Sugarcult is a pop-punk/alternative rock band formed in Santa Barbara, CA in 1998. The name 'Sugarcult' came from a group of lesbian women that used to live across from the lead singer Tim Pagnotta. Tim met ex-drummer Ben Davis during a cigarette break at school. Ben (who then played bass) and Tim started to play together on a regular basis until Tim invited Airin Older, a fellow classmate, to join. Ben was moved to the position of drummer and Airin filled in for Ben on bass. Marko DeSantis was added into the band after meeting Tim back stage at a Superdrag concert. Tim met ex-drummer Ben Davis during a cigarette break at school. Ben (who then played bass) and Tim started to play together on a regular basis until Tim invited Airin Older, a fellow classmate, to join. Ben was moved to the position of drummer and Airin filled in for Ben on bass. Marko DeSantis was added into the band after meeting Tim back stage at a Superdrag concert. The pair apparently met because Tim was wearing a suit that resembled the one Marko wore to the show. Tim asked Marko to join the band before even hearing Marko play a single note on the guitar. In the Summer of 2004, the critically acclaimed "Vans Warped Tour" featured Sugarcult, who were, in fact, the final band to play at the year's tour. 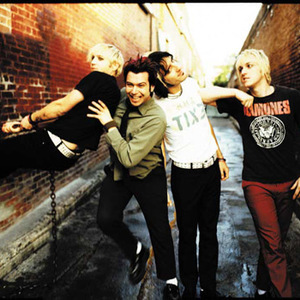 After the tour, the Band teamed up with Green Day, and New Found Glory on their tour of the US, and were a huge success. In 2006, The EA Games title "Burnout 3: Takedown" featured the song "Memory" from the Album "Palm Trees and Power Lines" and was an instant success. After years of touring and recording, Ben was asked to leave the band due to his extensive alcoholism. Ben has said he would rather be sober out of the band than drunk and still in the band. Kenny Livingston was drafted into the band after recording Palm Trees And Power Lines and touring with the band.